Want to be the favorite parent? Rent a bounce house for their next party today! Bring out the KID in everyone. Rent a party inflatable for your next event today! I would highly recommend this company. They are very family friendly and provide excellent service! I have dealt with other inflatable companies and Bounce House Louisville is by far the best in the area. I would recommend this company to anyone. They were very good about working with us on the pickup and drop off times. We use this company every year and will continue to use their service in the future! Inflatables have taken the party scene by storm and are popping up at school events, birthday parties, neighborhood events and family reunions across Louisville, KY. They are simply the best way to bring big excitement to any age. Inflatables are the key to giving more people a greater opportunity for fun at any party. For years, bounce houses have been one of the most popular attractions for any celebration, and not just for kids. 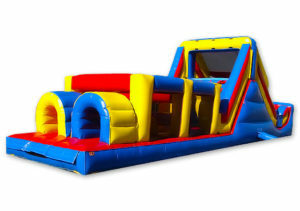 We provide bounce houses, slides, and obstacle courses that are perfect for all ages. Even grandma and grandpa can enjoy the fun! Due to increased popularity, the popular party staple is now more affordable than ever. No need to shell out big bucks to provide the block party of the year, we provide everything you need to keep everyone entertained for hours. From a princess castle to a sumo suit, we have it all. Because every party is different, we have a wide range of inflatables to choose from. If you’re looking for more than your average bounce house, inflatables are the way to go. Planning a big event? No problem. 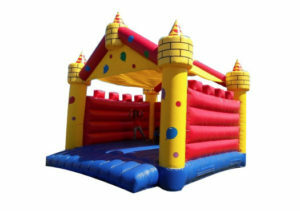 We carry commercial grade bounce houses that are designed for large crowds and tough use. These bouncers weigh significantly more than their home counterparts and are typically larger than a standard bounce house. Some of our most popular commercial inflatables feature double slides, 20-ft walls, and plenty of space for all ages to enjoy. Commercial inflatables work perfectly for neighborhood block parties, company events with the whole family, or city celebrations for Louisville and surrounding areas. To meet the demands of a large crowd, commercial-grade units give you the peace of mind that your guests are safe and taken care of. Wondering what kind of bounce house would work best for your event? We have dozens of themed bounce houses to fit your style. From a monster truck to under the sea water slides you can find something your guests will love. 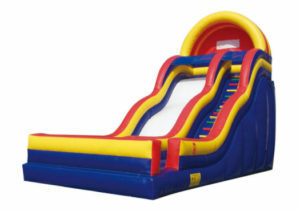 We have everything from a cowboy house to a safari-themed inflatable, as well as several types of castles and slides. For the sport’s fanatic, we have baseball, football and even a baseball option to keep everyone playing. Our extensive selection makes it easy to provide a breadth of options for our customers. Take the competitive level up a notch with inflatable basketball courts that get the whole crowd involved. Both kids and adult enjoy the lift of the bounce base to jump as high as they can and dunk the ball on the ring. These give a whole new concept to the game of basketball and will give your mini basketball star a whole new approach to the game he already loves. Inflatable water parks are the perfect way to celebrate summer in Louisville, KY. They are similar to bounce obstacle course, but they add the element of a water park into your backyard party. They are made of a thicker material that is more durable and designed for rigorous, slippery, and rough play. The water park inflatables come with hand holds, support features, and additional texture to help the little ones, but are still fun enough to let the big kids go wild. Most water park inflatables have one or more features including water slides, slip-n-slides, and splash pools. Some of our water parks can be combined with non-water or dry inflatables to give more variety to your guests. Please note that the take-down time for our water parks is longer than with standard bouncers to allow the unit to completely dry before storing to prevent mildew growth. This is usually a bounce house connected to another inflatable, like a slide, tube, obstacle course, etc. They give the best of both worlds, and can accommodate more children than a simple bounce house alone. You can have kids in the house, on the slide, and everywhere in between. Combos also work great for crowds of various ages, so there is something for everyone to be excited about. John Scurlock invented the first bounce house and the first safety air cushion, which is still used by fire departments today! Commercial grade units last longer than 15 years or 4,000,000 bounces. The world’s tallest inflatable water slides are taller than 4 stories high. Our bounce houses make it easy for kids of all ages to celebrate together. Big or small, indoors or outside, we’ve got you covered. If you’re looking for an inflatable for your next party in Louisville, KY or surrounding areas give us a call today! Nothing says fun like a GIANT slide. Rent your inflatable slide today! At Bounce House Louisville we are dedicated to making sure your celebration is stress-free and full of fun. Birthday? Graduation? Family Reunion? Church Picnic? Spring Break? We’ve got you covered. Due to increased demand for our services, we are proud to partner with Astro Jump of Louisville to better serve you.